Orca Tactical is a Pacific Northwest-based supplier of military-grade tactical gear, shooting gear, and outdoor sporting goods. The founder and owner, Doug Taylor, strives to provide military, first aid personnel, outdoor sports and gun enthusiasts, with high quality tactical and outdoor gear and equipment. Orca got its start in Doug Taylor’s garage after a molle EMT pouch spilled medical first aid contents all over the floor. Having seen three similar failures in a single year, Taylor got fed up and decided to start his own company through collaboration and testing with fire, EMTs, military, and law enforcement personnel. Now Orca Tactical caters to professionals who need gear at a reasonable price that doesn’t rip, fail, stick, or suffer from bad design. 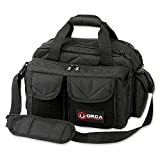 The Orca Tactical Gun and Ammo Shooting Range Bag is a mid-sized range bag. It provides compartments, pouches, and pockets for storing handguns and ammo, gun accessories, and supplies from large to small. The bag is suitable for use in the shooting range or on duty in the field. Orca Tactical designed this range bag because competitors’ products were either cheaply made (and would fail), or too expensive for professionals on duty, who often had to buy tactical gear out of their paychecks. The Orca Tactical Range Bag is available in three colors to match almost any uniform or color scheme: black, coyote brown, and OD green. The entire bag consists of 600D polyester, double-sewn and padded. Orca built this bag to last, take a beating, and protect your valuable gear. At 1584 cubic inches (16” x 11” x 9”) overall, the Range Bag is medium sized. It can hold three or more handguns with room left over for ammo and other range essentials. The main compartment, for pistols and accessories, is 945 cubic inches (15” x 7” x 9”) and comprises over half the bag’s total volume. Both the main compartment and a smaller similar compartment feature fast-access lockable YKK zippers with rubber handles. This configuration allows users to access either chamber quickly with one hand, or to lock them if needed for reasons of security or legality. With a total of thirteen compartments, pockets, and pouches, the Range Bag has plenty of organizational capacity to keep your gear sorted, even if you need to keep up with a lot of different small items. We appreciate the attention to detail; Orca positioned each pocket or pouch in such a way that it is different from the others, and fills a unique niche. Users reported that the shotgun shell loops were an excellent addition to the range bag that they’d never seen on competitors’ models, and found them appropriate for tactical duty bag purposes. The double-stitched elastic bands are also very sturdy and can hold magazines, speedloaders, spotting scopes, or odd-shaped items like heavy duty staple guns. The side pouch within the main compartment is perfect for keeping essential accessories like shot timers separate from the rest of the bag. We liked the multipurpose beverage-can shaped drink holders, too. One thing that is clear to anyone handling and using the bag is that Orca Tactical tests and prototypes their products extensively. Two features that drive this fact home are the wide-grip handles and the scuff pads on the bottom of the bag. The wide-grip handles are suitable for carrying heavy loads with less hand fatigue, and the scuff pads allow users to place the bag down on almost any surface without dirtying it or damaging it. The Orca Tactical Range Bag is one of the few bags we have seen that is indeed a multipurpose range and tactical bag designed with input from law enforcement, military, and other duty professionals. Orca also solicits design feedback from a network of soldiers from Joint Base Lewis McChord, Fort Bragg, and Camp LeJeune who engage in rigorous on-the-job testing. Like most companies, Orca may occasionally have quality assurance issues. One user reported that he received a bag with a missing lockable zipper on one side of a pouch. Fortunately, their customer service response was excellent. Another user said she wished the bag came with one or two hard inside pockets for eye protection. RC says his Orca Tactical Range Bag is well-made and robust. He can fit seven handguns and still have room for hearing protection, shooting gloves, glasses, extra mags, and loaders. Tim K. bought the Range Bag for USPSA an IDPA competitions where he has to carry all his gear between stages. A backpack wasn’t cutting it, but he says the Orca Tactical product has exceeded his expectations. Robert D. says the bag is perfect for his pistols and other shooting essentials: eye and ear protection, CLP, a mag loader, magazines, pistol ammo, sunscreen, and small range tools. He is planning to buy another to keep in his vehicle as a medic/combat lifesaver (CLS) bag. If you need a well-designed, sturdy, and affordable range bag the Orca Tactical Range Bag is a top pick. If you need to fit more than a few pistols and some ammo and accessories you may want a larger bag, but considering that action shooting competitors have reported that the bag is sufficient to last them a full weekend of shooting matches, we think it is big enough for most shooters. Orca Tactical focuses on quality, craftsmanship, durability, and product affordability. They believe in their community of armed professionals and rescue personnel, and their dedication shows. We are blown away by both the value and the quality of design that have gone into this Range Bag. We recommend it as your next range bag, tactical bag, camera bag, or even diaper bag. DURABLE: This gun bag is durable, yet lightweight. Made from high quality 600D polyester fabric, our tactical range bag is double sewn at all strength points. The perfect companion for those tired of carrying heavy range bags. ORGANIZED: This range bag for handguns main compartment contains a removable velcro divider for personal organization. Tons of fully PADDED and organized compartments, pockets, pouches, and elastic to store pistols, gun and range accessories, handgun and semi-automatic magazines and shotgun shells. Also perfect as a camera bag or tactical diaper bag. INCLUDES: Our gun bags for handguns has an UPGRADED, wider grip handle for larger hands. 2 Velcro faced accessory pockets to display morale patches and high quality polymer bottom scuff pads to protect the pistol range bag on any support surface.